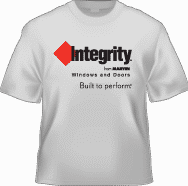 Click here to visit the Integrity site, scroll down and watch their 3 videos. After you do, a form will show up underneath it that your can use to request your free shirt. Sizes are large and extra large. I’m guessing they have a limited quantity, so I’d request it a.s.a.p. I think I got one. I didn’t see anything telling me either way. didnt connect watch three videos no luck? I couldn’t find the videos.